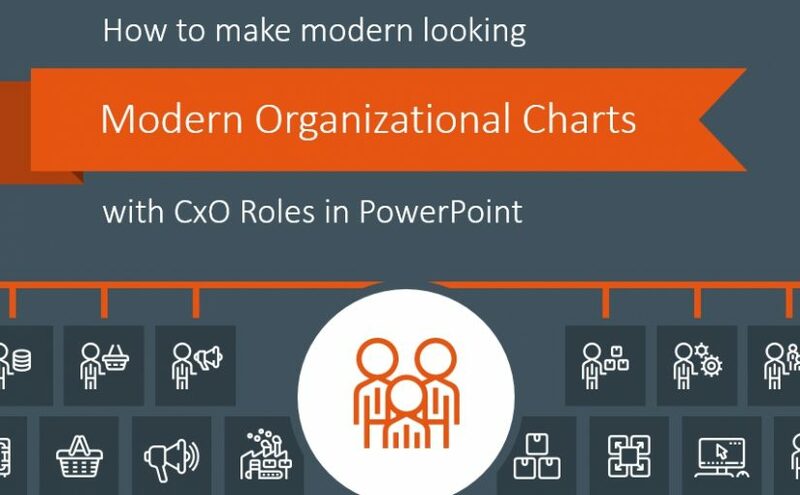 Looking for a way to make your organizational chart look creative and modern? Then it is a right place. 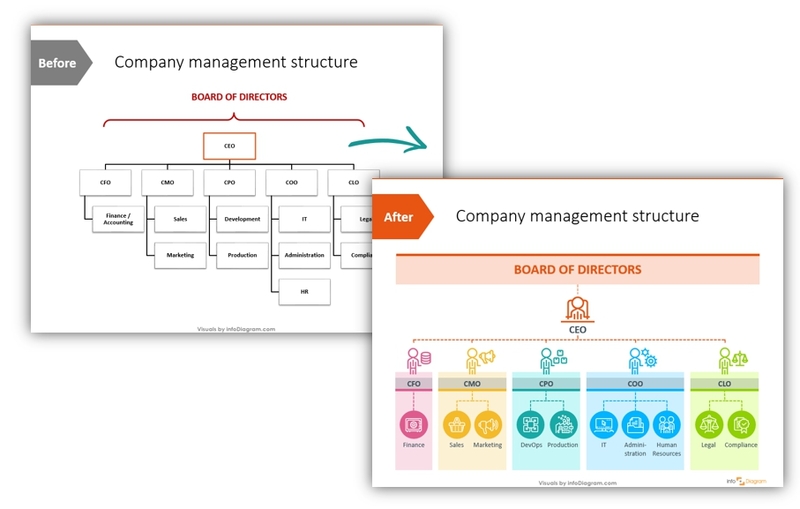 Today I’m gonna give a few hints and resources for quickly designing such HR structure diagrams using the PowerPoint. 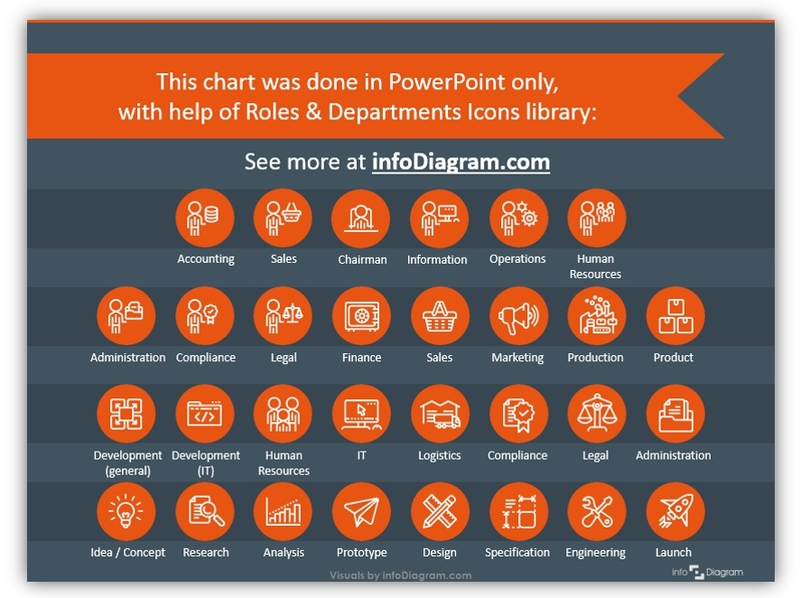 Download all the icons and slides from Company Roles and Department Structure Outline collection. 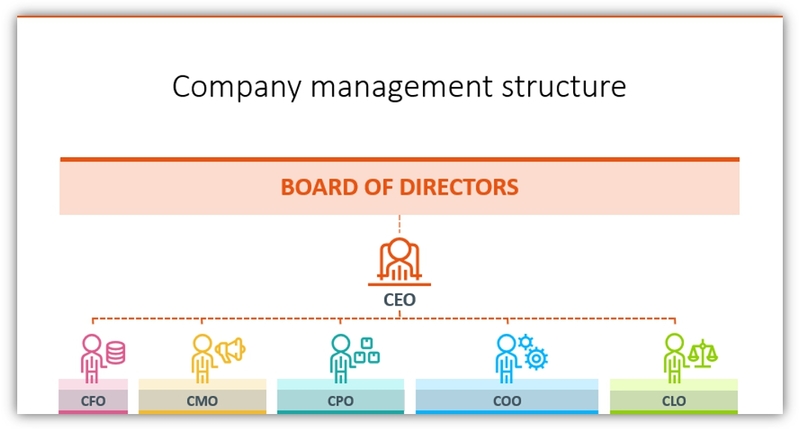 Here’s a step by step instruction on how to create such modern-looking flat style organizational chart. The MS Office SmartArt is a basic easy tool for creating various diagrams such as hierarchies, processes or cycles. However, default SmartArt looks not very attractive. Therefore with some additional tweaks, we will show you, how you can create neat organizational infographics. To create the SmartArt object, open the menu (Insert -> SmartArt), go through variants and choose one that suits you best. In the case of drawing a company structure, it’s a hierarchical tree diagram. Choose the most simple color style from SmartArt options, avoid all gradient and 3D bevel options at all costs. They are making your graphics less readable and old looking. We suggest choosing a flat style, color or a grey one. Then remove default outlines given by SmartArt tool, to create more modern flat style graphics. You can use your brand colors to illustrate the main departments or positions, for example. Once you will create SmartArt hierarchy more-less fitting your desired structure, change SmartArt to set of shapes (by applying the ungrouping function). This allows you to work more freely with your organizational chart. On our slide, we used five colors for five departments (plus we altered the color of the main icons), that made it easy to distinguish one from another. Think what is associated with every position and add a symbol associated with this position to create a more interesting org chart. 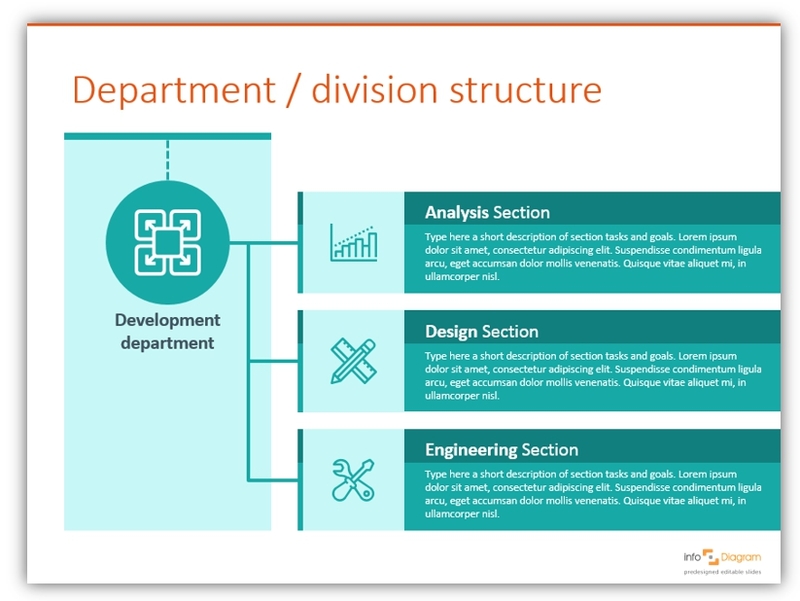 presenting division structure: one main icon of the department and elegant lines connecting each section (or project) with space for a longer description of each company section. product development process: flow chart of a product development illustrated with icons and comments/notes above on the dark background. Specific person positions can be placed above the process, to show who’s involved in monitoring or decision-making points. 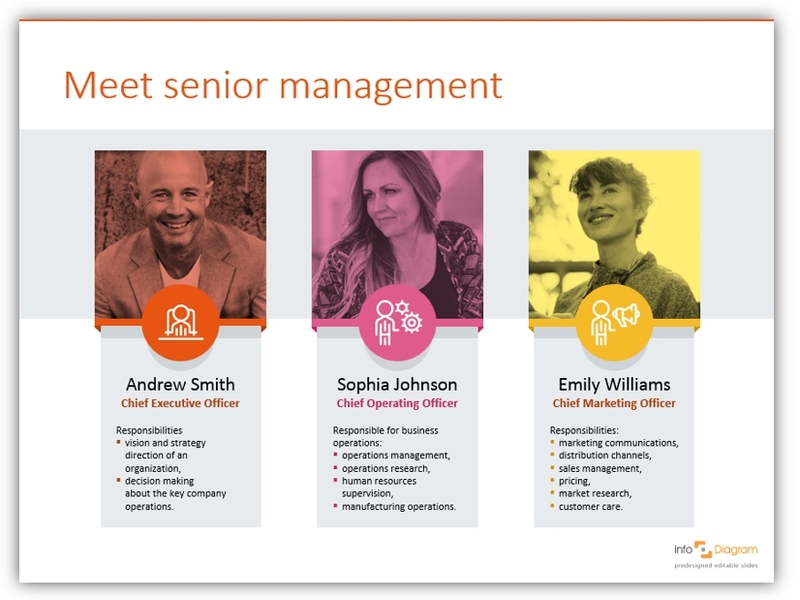 team introductory slide: to be used when presenting your management board or project team. Each person is assigned a symbol, corresponding to his/her position; plus we used different colors over pictures to make a slide more vivid. If you like the examples above, you can download the whole package we designed (or subscribe and get slides every month for your needs). 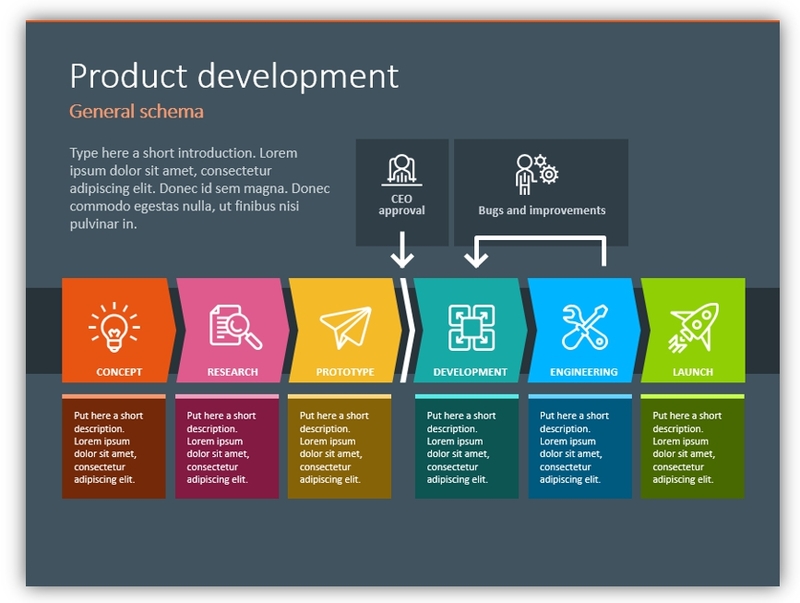 Should you need help with choosing or using the PowerPoint graphics, let us know here. We will gladly help.